Note	 Specifications for cables and connectors are provided in "Cable and Port Specifications." Table C-1 lists the environmental specifications for the Cisco MDS 9216 Switch. Table C-2 lists the physical specifications for the Cisco MDS 9216 Switch. Chassis requires 3 RU1 . Chassis depth including cable guide is 27.75 in. (70.3 cm). Chassis only: 31 lb (14.1 kg). 300 lfm2 through system fan module, or 80 cfm3 per supervisor, switching, or services module. Total of 160 cfm if slot 2 is filled. • If installed in a cabinet, a minimum of 2.5 in. (6.4 cm) is required between the chassis air vents and the cabinet walls. • If installed in an open rack (no side panels), the horizontal distance required between the chassis and any devices that exhaust air towards the chassis is a minimum of 6 in. (15.2 cm), and the distance required between the chassis air vents and any walls is a minimum of 2.5 in. (6.4 cm). Table C-3 lists the specifications for the Cisco MDS 9216 Switch supervisor module (which is fixed in the chassis) and the switching and services modules. Note	 These are the maximum dimensions of faceplate and board, and include connectors on board. Table C-4 lists the specifications for the batteries on the Cisco MDS 9000 Family Caching Services Module. Table C-5 lists the weight for each module in the Cisco MDS 9000 Family. Table C-6 lists the specifications for the Cisco MDS 9216 Switch power supply, which is 845 W and accepts AC input. Note	 For plug current ratings, see Figure C-1. Table C-7 lists the power requirements and heat dissipation for the components of the Cisco MDS 9216 Switch. Note	 Unless noted otherwise, the data in Table C-7 is based on worst-case conditions. Typical numbers are approximately 30 percent below the numbers listed here. A separate power cord is provided for each power supply. 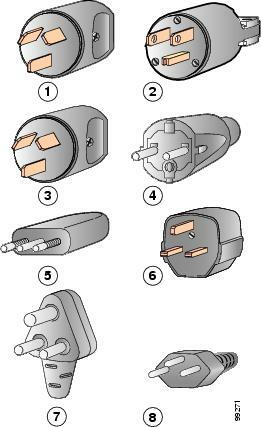 Standard power cords or jumper power cords are available for connection to a power distribution unit having IEC 60320 C13 outlet receptacles. The jumper power cords, for use in cabinets, are available as an option instead of the standard power cords. The standard power cords have an IEC C15 connector on the end that plugs into the switch. The optional jumper power cords have an IEC C15 connector on the end that plugs into the switch, and an IEC C14 connector on the end that plugs into an IEC C13 outlet receptacle. Only the standard power cords or jumper power cords provided with the switch are supported. Figure C-1 shows the supported power supply plugs for the Cisco MDS 9216 Switch. Figure C-2 shows the 250 VAC 13 A C14 and C15 connectors on the optional jumper power cord for the Cisco MDS 9216 Switch. The C15 connector connects into the C16 inlet on the Cisco MDS 9216 Switch power supply, while the C14 connector connects into the C13 receptacle of a power distribution unit for a cabinet. The power cord product ID is CAB-C15-CBN.